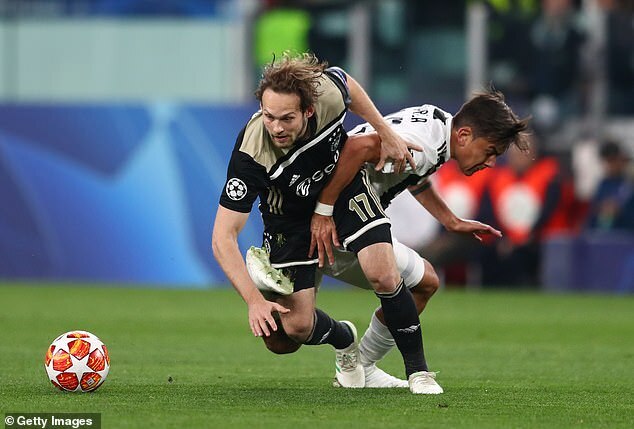 On Tuesday night in Turin, Ajax once again confounded all expectation by demolishing another of European football’s biggest names. 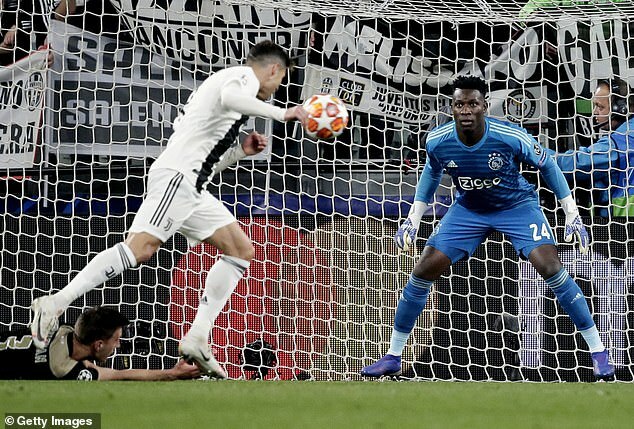 Having secured a 4-1 victory away at Real Madrid in the final 16, Ajax arrived at Juventus with a 1-1 scoreline from the first leg in Amsterdam. They fell behind through a Cristiano Ronaldo goal before Donny van de Beek and Matthijs de Ligt scored to seal another remarkable comeback. Now, the final four beckons and a tie against Manchester City or Tottenham. The Cameroonian was prised away from Barcelona with the promise of regular first-team football. He has made the jersey his own and is one of those expected to remain at the club next season. At Ajax’s De Toekomst training complex, a legend is never too far away. Onana told Sportsmail in 2017: ‘At Barcelona, I trained with the first team and even saved a few from Lionel Messi but he scores nearly every one even in training! Here at Ajax, we are very lucky to have the support of club heroes. ‘Every so often, Edwin [van der Sar] comes out on to the training field, even though he is now the CEO. He gives me tips, he picks me up after a setback. He’s one of the greatest of all time. 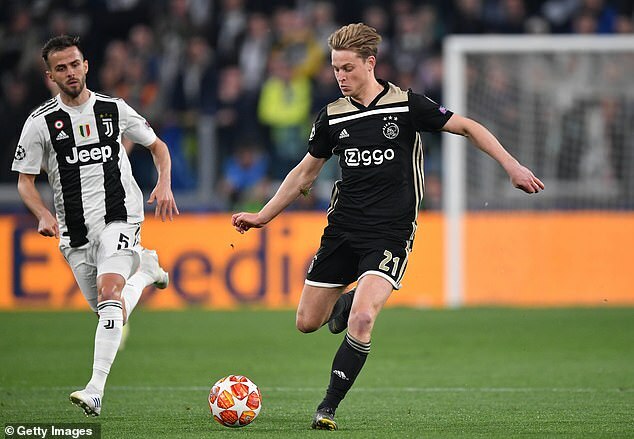 The full back has been on the Ajax books since the age of nine and has represented Holland in every age group from under-17 through to the senior team. His own personal story is inspiring in itself, as Veltman has overcome a serious cruciate ligament injury over the past year and is now firmly back into the first-team picture. Little wonder, then, that the 19-year-old is the object of desire for Europe’s leading clubs. Barcelona are at the front of the queue, perceiving De Ligt to be the natural long-term replacement for Gerard Pique. De Ligt’s potential has been clear for some time now and he performed well as a 17-year-old in Ajax’s Europa League final defeat by Manchester United. He will command in excess of £70million this summer. 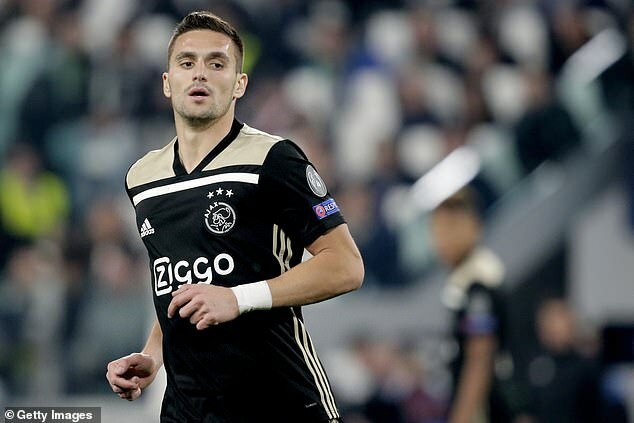 The man who could not get a game in Jose Mourinho’s defence at Manchester United is, remarkably, Ajax’s record signing in a deal that could rise to £18m including add-ons. Blind is another product of the Ajax academy and his composure and maturity adds confidence to the defence. Ajax’s entire defence in Turin was made up of academy products and the Dutch-born Moroccan full-back. Converted from a midfielder as a teenager, Mazraoui scored decisive group stage goals against both Bayern Munich and Benfica. He is the perfect modern wing-back, athletic and combative without the ball and high in quality in possession. The 21-year-old has already agreed to sign for Barcelona next season in a £67m transfer. In his homeland, he has been compared to Frank Rijkaard, Ruud Gullit and Johan Cruyff. No pressure, then. His assured passing makes him a natural fit for Catalonia – and explains why Pep Guardiola and Manchester City also pushed hard – but he is also capable of mixing his game up and asserting authority in midfield. In the Dutch media, his mother has promised to keep his feet on the ground, which explains why he still does his clothes shopping in H&M and is yet to have any tattoos. He is also said to have turned down a stand in his name at his hometown club of ASV Arkel. Group Stage – Drawn in Group E with Bayern Munich, Benfica and AEK Athens. Finished second with three wins and three draws. The old head in the side scored the fourth for Ajax against Real Madrid and is known for his powerful strike and smart use of the ball. The Dane has now been with Ajax for seven years and the media coined him as Ajax’s ‘boomerang man’ due to his explosive shooting from set-piece situations. Although he is not Dutch, he has played in Holland since he moved over as a teenager to Heerenveen. Spotted at Sao Paolo, Ajax sporting director Marc Overmars actually felt the club paid over the odds in signing Neres for £10m in January 2017, but now the Dutch side expect to receive around £50m this summer. Neres has hit double figures for goals and assists this season and scored a belting equaliser in the home leg against Juventus. He actually very nearly left the club in January. Ajax rejected a £38m offer from a Chinese club but they were were prepared to sell and hoped to replace him with the 18-year-old Mexican Diego Lainez, who turned them down for Real Betis. The Spanish side are eighth in their domestic league, which shows the scale of Ajax’s financial limitations. Paris Saint-Germain, Arsenal and Manchester United and now weighing up summer moves for the player. Nurtured at Ajax from the age of 11, Van de Beek is one of six academy graduates that started the match in Turin. He scored the crucial equalising goal on the night and has maybe gone under the radar amid the rapid progress of De Jong. Tottenham, who have previously raided Ajax for Toby Alderweireld, Jan Vertonghen, Davinson Sanchez and Christian Eriksen, are favourites to prise the midfielder away from Amsterdam, while Chelsea also have an interest. The Moroccan is one member of the team who has at a more conventional peak age and he has 17 goals this season in Ajax colours. Leicester, Arsenal and Chelsea have all scouted a player who grew up in Holland and previously played for Twente. 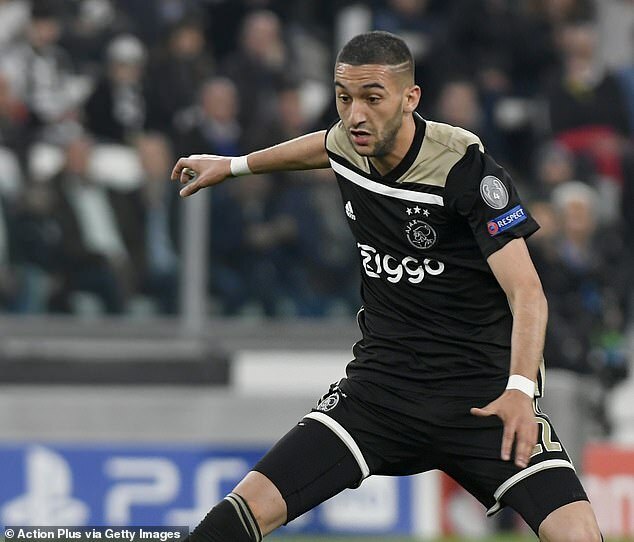 Mauricio Pochettino has tracked Ziyech for several years now and it will be interesting to see whether his progress this season prices Tottenham out of a transfer this summer. When Tadic informed Southampton last summer that he wished to leave the club, there was no stampede. Indeed, only one call came at all and there was some surprise when Champions League-bound Ajax decided to move for a player who is now 30. Incredible to think, really, when Tadic turned Real Madrid’s Bernabeu into his own personal playground last month. At Southampton, Tadic saw his peers leave him behind. Off they went; Morgan Schneiderlin, Virgil Van Dijk, Sadio Mane and Toby Alderweireld, all departing for more ambitious clubs. He was the last to leave but he picked his exit well. He now has 28 goals for the season and his performance in Madrid earned a 10/10 rating from the French newspaper L’Equipe, becoming only the ninth player to receive a perfect rating in their 73-year history. He scored one and made two in a dazzling personal display. Tadic has been a major voice in the dressing room, holding three hours of talks with manager Erik Ten Hag following the draw against Bayern Munich earlier in the season In the Hilton Hotel in Munich, Tadic explained that the players had grown tired of the manager’s approach to training, where 11 v 11 games would demand reserve players to mirror the team’s upcoming opponents.